It’s been a while since I posted anything in this blog. As usual, I’ve been busy with work. Wrapping up last year’s projects. Closing in on upcoming ones. It’s exciting! Liquid lipstick is currently gaining its fairshare of the spotlight at the moment. In specific, those with matte finish. 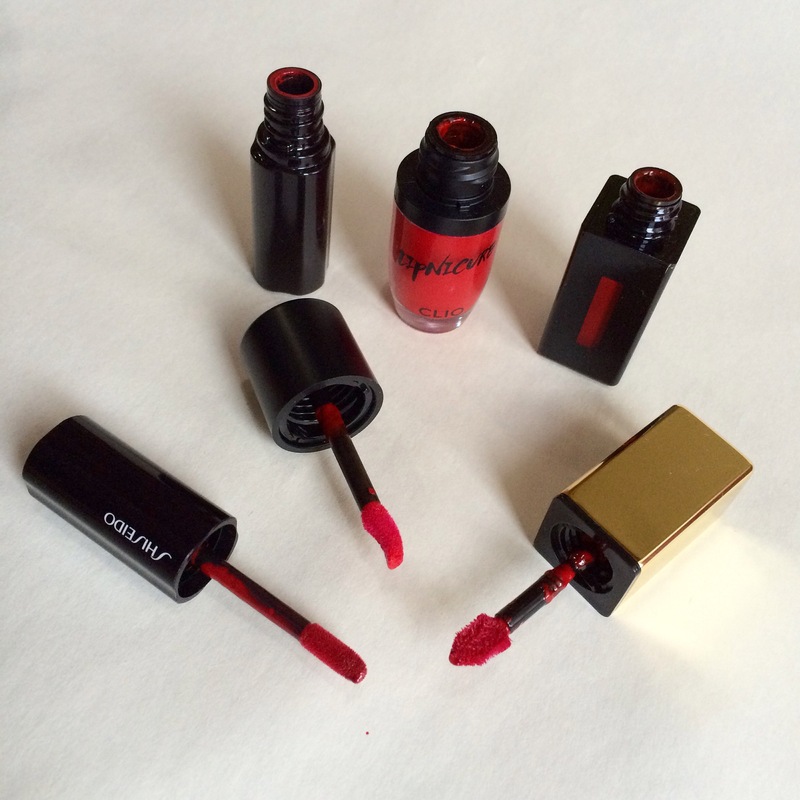 One colour that looks incredibly gorgeous in liquid form is red. Hence, I have three! If ever I need justification of owning three, I would argue that they each have different finish. All colours lean toward cool tone red but shade and tone is not what I’m going to write today. I’m going to focus on the texture and finish. It’s a liquid lipstick that turns to matte finish once applied. Texture is liquid smooth and application is really nice. But once it settled into your lips, it wont budge. So you need to be quick. I love how vivid the colour is and it’s real pigmented. The doe foot applicator is a bit curvy that it sort of hug your lips and gives a nice thin to medium layer application. As I said it wont budge, but like a nail polish it chip and reapplying on top of your lipstick will look thick and ugly. I usually remove the entire thing and apply it from the start rather than layering it. It stays nicely throughout meals and drinks, but once it chipped, it’s ugly. It’s also drying. Brilliant pigmented colour that is true to the tube. It doesn’t feel as sticky as lip glosses but it doesn’t dries out matte and doesn’t leaves any stain at all. It’s just like a really pigmented lip gloss that feels thin and comfortable on the lips. Hence, it’s no sursprise that staying power goes out of the window after meals and drinks. But I love the colour and sheen. Who needs staying power anyway when you have so much lipsticks? Hell, I want to reapply my lipstick 10 times a day if I can. It looks like a transparent lip stain with a very vivid colour. Once it dries out it will leave a stain on your lips. Application could be layered for a more opaque finish. I love the sort of translucent sheen that you get from this lipstick. The three of them serve a very different purpose. I would go for the YSL for everyday red. Whereas for special occassion or look, I’ll go with the other two depending on my mood.